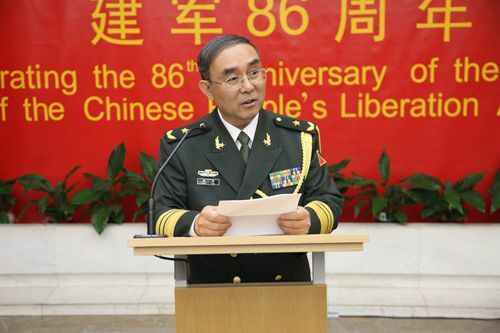 On the evening of 29 July, Major General Cai Yong, the Defense Attaché of the Chinese Embassy in the UK hosted a grand reception at the embassy to celebrate the 86th anniversary of the founding of the Chinese People's Liberation Army (PLA). H.E. Ambassador Liu Xiaoming, Madame Hu Pinghua and other senior diplomats of the Chinese Embassy attended the ceremony. Chief of the Defense Staff General Sir Nicholas Houghton, Air Chief Marshal Sir Andrew Pulford, Lord Howell of Guildford, Baron West of Spithead, Deputy Chief of Defence Staff Lt. General James R. Everard, Commandant of the Royal College of Defence Studies Lieutenant General Sir David Bill, Controller of Royal Air Force Benevolent Fund Air Marshal Christopher Nickols also attended the reception together with more than 200 British high-ranking military officers, MPs, government officials, friendly personages from all walks of British society, military attachés in the UK from various countries, representatives from the Chinese companies and the Chinese community in the UK. Defense Attaché Cai emphasized in his speech that the Chinese people are making unremitting efforts to realize their "Chinese Dream". China continues to adhere to an independent peaceful foreign policy and a defensive national defense policy. China's military forces continue to actively participate in the United Nations' peacekeeping operations. The development of China and the China's military forces is in line with the fundamental interest in world peace and development. He also made a positive evaluation of the China-UK military relations and hoped that the two sides would work together for the further development of the bilateral military relations. 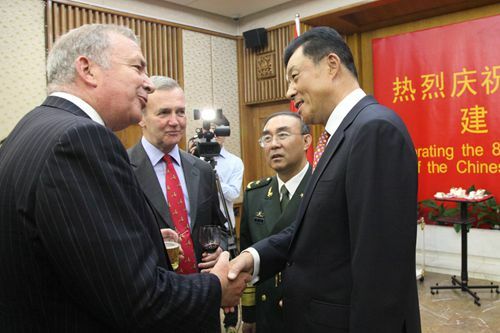 Ambassador Liu Xiaoming had cordial conversations with General Sir Nicholas Houghton, Air Chief Marshal Sir Andrew Douglas Pulford and others. The guests spoke highly of the achievements made by China and the China's military forces. 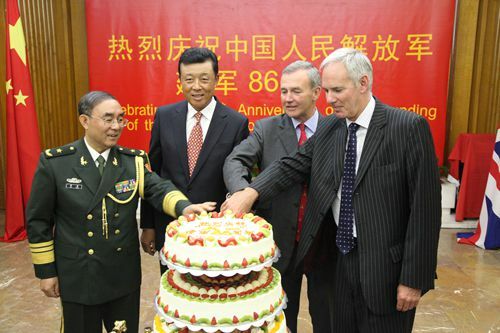 The British generals also said that they will continue to facilitate the development of UK-China military relations. The film, China's Military 2013 was played at the reception and pictures of the achievements in PLA modernization were displayed. In addition, books and materials introducing the China's Military and China's national conditions were also handed out at the reception. The reception ended in a festive and friendly atmosphere.